September 2014 - Website of kennetaccordionorchestra! The KAO has been busy recently with two concerts, a week apart. The first one was on 6th September at the Deanwood Golf Club and was arranged by the Newbury Lions Club to raise money for their Christmas appeal. 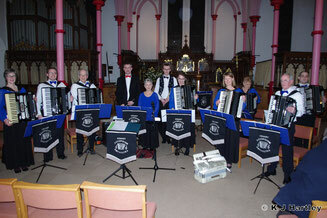 The concert was enjoyed by about eighty people and raised over £1,000 for their good causes. Nigel had changed the format of the concert slightly and included three soloists and also a duet. Ronkey Bullard performed Astor Piazzolla's 'Oblivion' playing flute with the orchestra accompanying her. Leader of the Orchestra, David Hall played 'My Love is LIke a Red, Red Rose' and Nigel played 'Gabriels Oboe' and the audience were also treated to Nigel and Helen playing 'Home Away from Home' as an accordion duet. The second concert, followed the same format, and took place in the wonderful Melksham United Church and raised £240 for their new mother and toddler group. This concert had been requested following two successful events held at the Devizes United Church and they had told their friends at Melksham about the KAO and they were not disappointed. On 7th June, the KAO held a very successful concert at the United Reformed Church in Hungerford, as part of the church's 20th century exhibition weekend. This was a new venue too and was enjoyed by about eighty people and raised a considerable sum for the church use. On 21st June, the KAO had been invited to perform at the Royal Wootton Bassett music festival. The adjudicator, Mr Andrew Hansford commented that the KAO performance 'Was outstanding music-making and showed many exceptional musical qualities' and awarded the orchestra 90% and an 'outstanding' category. An exceptional performance and very justly deserved. The KAO are now looking forward to performing at the Southern Area Festival arranged by the National Accordion Organisation at the Allendale Centre in Wimborne on 1st November. They will be entering several sections and are now hard at work rehearsing for this event. The KAO are always pleased to assist with fund-raising events and are happy to consider requests, so please do keep in touch with us. The accordion is a fabulous instrument, is environmentally friendly and we want to promote it as much as possible.